Paying homage to a chic bar atmosphere, Laqué Nail Bar delivers a novel approach to the nail salon experience. Owners Robert and Marina Torosian conceptualized their one-of-a-kind space to surround clients with opulence and luxury. 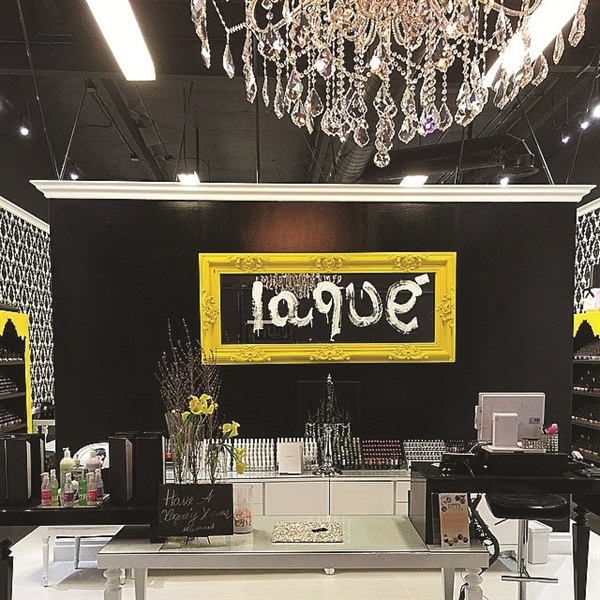 Laqué Nail Bar owners Robert and Marina Torosian both come from legal backgrounds and had no prior experience in the nail salon industry, but after an eye-opening personal experience, they decided to dive in. Marina Torosian would frequent nail salons in Los Angeles to get her own nails done. Robert accompanied her on one of her salon visits and noticed how instead of providing a new pumice stone a nail technician was merely scrubbing dead skin cells off the pumice stone that was to be used on his wife. The Torosians were taken aback by this blatant disregard for proper sanitation since porous items like pumice are one-time-use only. This incident struck a chord and they came up with the idea to create a nail salon of their own and, of course, included good sanitation as a primary component. After years of research and countless visits to other establishments in and around Los Angeles, they decided they were ready to launch their own business. To be fully hands-on and oversee Laqué’s daily operations, Marina quit her job. Robert continues to practice family law. Once his day at the office is over, he makes his way to North Hollywood. It’s difficult to see when the Torosians make time for themselves and their family, as their days begin at 7 a.m. and end when Laqué closes its doors around midnight. “The salon is more of a 24-hour job because there are so many different moving parts. You always have to be constantly involved,” says Robert Torosian. The original salon is located in North Hollywood, Calif., near the historic arts district. People questioned the couple’s decision to open shop in a North Hollywood strip mall because the area is made up of low- to medium-income households, but the Torosians aren’t all about targeting high-end clients. “The decision to open our first location in NOHO was based on the population we planned to serve. We want to provide services for everyone,” says Torosian. Based on their success in North Hollywood and their desire to boost the credibility of the Laqué brand, the Torosians also decided to expand to Beverly Hills. Laqué Nail Bar’s menu is crafted to match the bar theme of the salon and that includes naming some services after cocktails. “Quick shot” express services include a basic manicure for $7, pedicures for $10, and a combo at $15. Deluxe services incorporate hand-crafted scrubs and body butters created by a Northern California company to offer a genuine “cocktail” experience. “The Rolls Royce of our manicure-pedicure is called the Dirty Martini. It includes everything from a hot towel and massage to different types of scrubs,” says Torosian. Acrylic nails are the most in-demand service, specifically stiletto and coffin shapes. 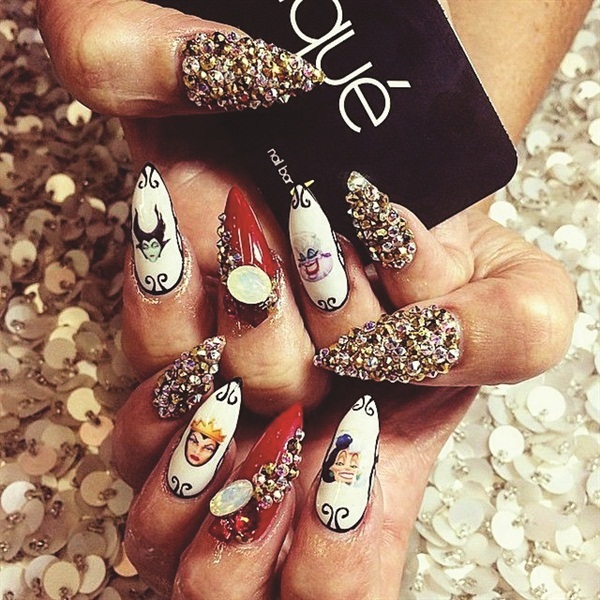 The most popular nail enhancement at Laqué is coffin-shaped acrylics with iridescent AB Swarovski crystals. A full set is $35 and the crystals add $10 per nail. Designs can be customized to client specifications. “We’re blessed with such creative, talented technicians; the designs all depend on the imagination and taste of the client. The technicians do their best to recreate them,” says Torosian. Laqué has a large staff, in part due to their focus on high sanitation standards. The staff includes three cleaning crews: day, night, and deep cleaning. “Including our cleaning crews and front desk, we employ about 45 people at the North Hollywood location,” says Torosian. The Torosians allow their nail techs to decide what type of structure best suits them as far as full-time or part-time employment, and they hire nail technicians of all skill levels. Master technicians come in periodically to train the nail techs on different techniques. Torosian decided to go with a baroque, royal theme in the original location. 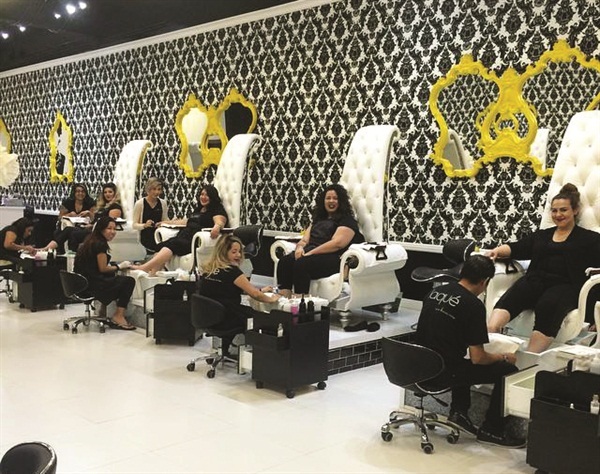 Upbeat music plays in the background as clients relax and take in the black, white, and yellow color scheme that surrounds them. Even the beverages and food items the salon provides for its customers contribute to the chic bar atmosphere. It has 16 stations in total: eight bar stations and eight pedicure stations that can be used for both pedicure and manicure services. From the reception area to the restrooms, Laqué provides a visually appealing setting for its clients. Laqué does more than nails. It is also a beauty bar that provides makeup services for all occasions, eyelash extensions, threading and waxing, facials, masks, and microdermabrasion. “Ninety percent of our business is focused on nails and the other 10% is eyebrow threading, lash extensions, and other beauty bar services,” says Torosian. Laqué is divided into sections to properly accommodate each service, a critical efficiency for the 100-120 clients who come in daily. In Laqué’s marketing strategy, social media is king. With Robert in charge of the salon’s social media footprint, it has established a presence on Facebook, Instagram, and Twitter. The platform that has provided the nail bar with the best exposure is Instagram. “You want to have a constant flow of content so people are always reminded of your brand,” says Torosian. He strives to keep Laqué interactive and encourages people to visit through giveaways and by answering questions directly on their social media accounts. Recently Laqué began using Snapchat to create a more personal connection with its followers — current and future customers. Through Snapchat, the Laqué team reveals tantalizing glimpses of everyday, behind-the-scenes operations. Another area that the Torosians pay close attention to is client retention; approximately 90% of their clients are repeat customers. They receive about 1,500 calls a day to set up appointments. Bookings for first-timers are done on the 20th of each month, by which time repeat clients have already scheduled their follow-up appointments. Locations: North Hollywood and Beverly Hills, Calif.